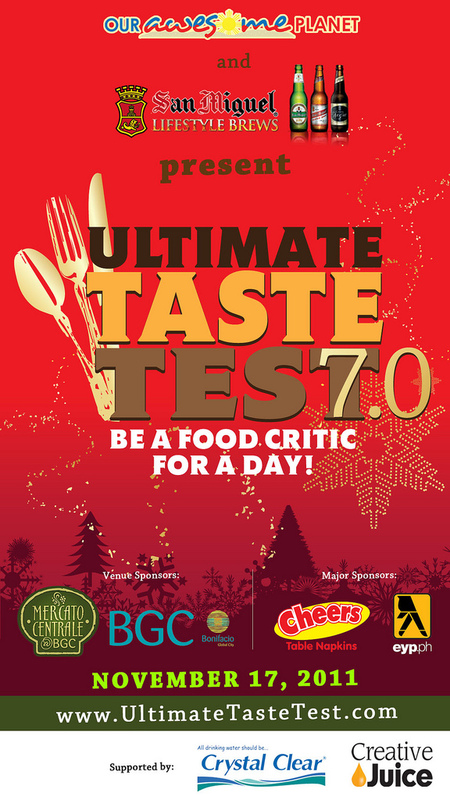 The Food Alphabet and More: Ultimate Taste Test 7.0 coming up!! October 28 to November 13: You can reserve and purchase ticket through Bank Deposit. Email a copy of the deposit slip to admin@ultimatetastetest.com to reserve the tickets. All reserved tickets need to be claimed on or before November 13. For those who want to buy tickets and those who made the deposit, you can pick up your tickets at Mercato Centrale on weekends or at the Creative Juice Office (Tel. # 470-9925 or 570-7827) during office hours, starting November 9 (Wednesday). UPDATE as of 3 November 2011: As of now, tickets are still in production. Tickets will be available by next week. You may reserve your tickets by making a deposit through the bank mentioned above. When claiming your tickets, we need your original deposit slip. On November 17: Onsite Selling (Cash Basis only) for the remaining tickets. We will announce one day before if there are tickets available on the day itself. For questions and inquiries, please email admin@ultimatetastetest.com. Brought to us by Anton Diaz of OUR AWESOME PLANET. See you then!! See my experience at Ultimate Taste Test 6.0.